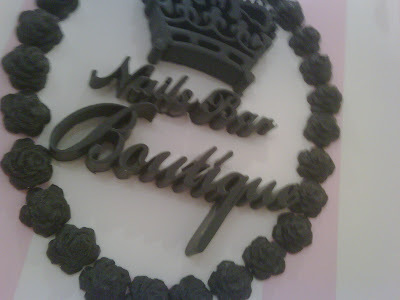 Blogger, Confashions, had a previous post reviewing this new nail place called Nails Bar Boutique. I never heard of it before reading about it in her page. And yesterday was my time to do my nails and I usually like to do them solo to be able to have more time to myself. Don't get me wrong, I love going with my friends and I enjoyed those times when we had the nail place all to ourselves and gossiped like there was no tomorrow! But their are times when pampering and relaxation came hand in hand and were meant to be done with no distractions. Yesterday was the time. The nail salon is located in Dar AlAwadhi right next door to Munch. Its was my first time to visit the mall and it was kind of really quite. The salon was very cozy and warm with its shabby chic design. No strong colors, it was all in beige, something different in contrast to the loud colors we've been used to in nail bars. I was the only customer at the time, so it was total quietness! There were chiffon curtains on both sides of my seat, with the aim of separating other customers from each other. Those curtain could be rolled all the way to cover your entire space (imagine circular curtains and your in the middle of the circle) for total privacy). I had the Ramadan exclusive manicure and pedicure treatment called the Exotic Date and Wild Honey Buff. The manicurist did a really good job with the nails and then gave me this date scrub followed by a date creme! I smelled soo good better than the almond treatment I had in Bubbles. That one was longer, but the date was so sweet smelling and I was moisterised even after washing up. Compliment of Bella Lucce products. Too bad this treatment is only for Ramadan. They had this other exclusibe treatments for this month, the Nourishing Sandlewood and Almont Creme for nails and Almond Spa for body. While the manicurist was doing my nails, I looked at the shop's services menu. I remember Confashions had the list on her page but when I looked at it more closely I suddenly had the urger to have the 10 minute back massage due to the stress I was feeling these days I felt my shoulders were very stiff (which the masseuse confirmed later). I thought the massage was something they could do while I had my nails done (like the back massage you get done while putting hair treatment in the salon)! NOT! It wasn't. Ofcourse, they offered to do it while I was still seated, but I had to wear a towel! I was like noway! So, I thought why not try their massage room. Cozy room complete with shower and was dark with candles(Yes!). I think the masseuse was Chinese and she was really really really good. She put pressure on every point of my back, it was like she was trying to read me! I didn't want it to end! 10 minutes is always a long time when you're waiting for something to happen, but when you want it to last forever it ends quickly! Good thing they offered a 5 minute foot (with leg) massage (I think it was complimentary). Again I think she read me! I loved her and thanked her graciously for the great job! I wasn't even prepared for a massage and this is something I never do without preparing myself mentally beforehand! But I have no regrets whatsoever! Alaaaaa shawagteeny! First thing lama arja3 liq8 ! !